The Opportunity Atlas puts systemic inequities on display like never before. A core belief at the Commit Partnership that drives our work is that talent is equally distributed, but opportunity is not. A new tool from Opportunity Insights provides a clear demonstration of this very problem. Opportunity Insights in a non-partisan, non-profit organization whose purpose “is to develop scalable policy solutions that will empower families throughout the United States to rise out of poverty and achieve better life outcomes.” It’s a big mission, one requiring a deep well of data to identify systemic inequities that keep American families in cycles of impoverishment. And with the new Opportunity Atlas, those systemic inequities are on display like never before. The objective of the Opportunity Atlas is to measure the average outcomes of Americans by the neighborhood in which they grew up. A sample of 20.5 million Americans born between 1978-83 were traced back to the census tracts in which they were born and raised. Federal income tax returns and census data were then used to measure annual earnings. The results, neatly color coded across a map of the country, are stark. 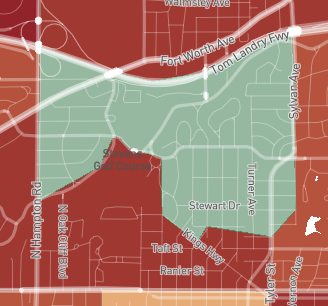 Take, for example, just two census tracts in North Oak Cliff. The average income for children born in the upper tract is $50,000, nearly twice as much as the average income for children born in the lower tract ($28,000). But the data (and the disparity) doesn’t stop there. The poverty rate for the lower tract, from 2006-10, was over three times that of the upper one. Children born in the bottom half had a greater likelihood of staying in the same city, even the same census tract, than those born in the upper section. They also had a greater likelihood of ending up incarcerated. All of these variables, and many more, can be explored by state, city, and neighborhood. Furthermore, you can adjust these outcomes for children by race, gender, and parental income. You can explore stories provided by the Opportunity Insights team, or seek a greater understanding of your own by exploring the census tract in which you were born. The methodology of the Atlas is predicated on research that suggests the place in which you were born “has substantial causal effects on [the] prospects of upward mobility, whereas where one lives as an adult has smaller effects.” We’d like to think that if our hometown doesn’t provide us with opportunity, we have the ability to pick up and move to a better life. But as the Opportunity Atlas clearly, the effect our upbringing has on us can be harder to leave behind. Or put more simply, some places are easier to leave than others.